I've finally taken the plunge and joined facebook! I haven't taken to it in the least bit and it shows what little interest I take in people around me though as I couldn't think of people I want to add as my friends. I do have my reasons for joining. 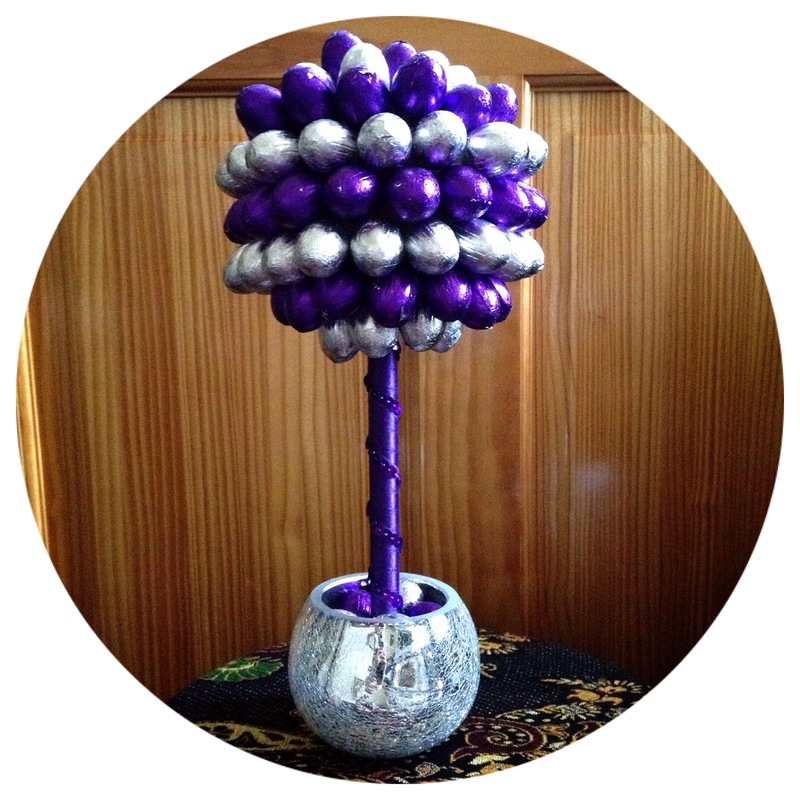 I needed to make another sweet tree so I asked for some suggestion and then went in search of some of those treats. I couldn't find anything until I came to my local supermarket and these eggs were on for £1 so bought 5 bags and used 4 of them. 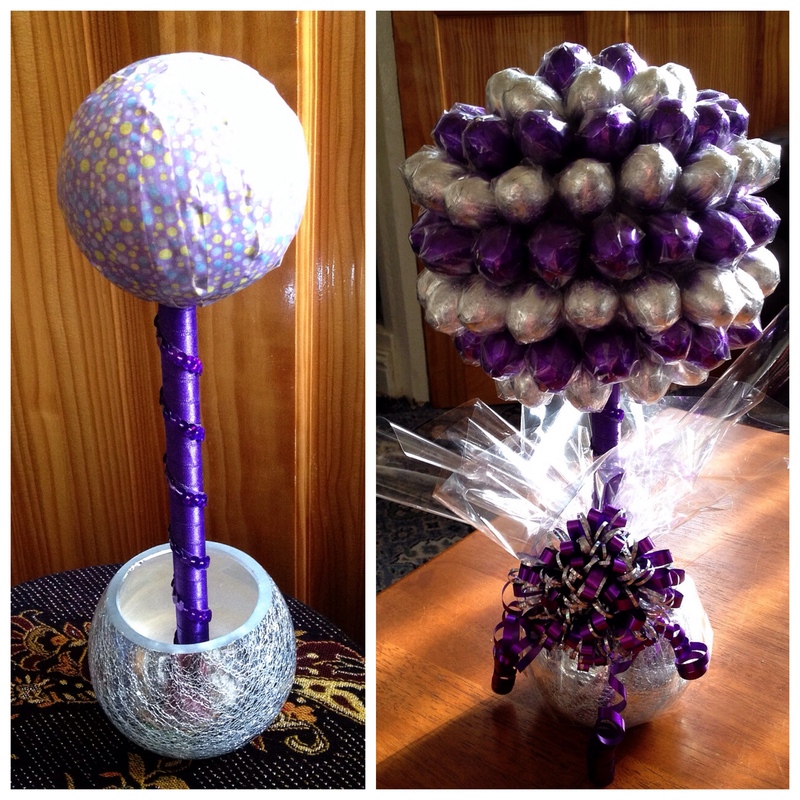 It is for a wedding I'm attending this weekend but I decided to give it sooner to display and with it being Easter themed a little closer to the event so it didn't look completely weird for a wedding. They didn't even care that they were Easter eggs as the colours go so well together. Originally I just stuck the eggs in as they were but the foil was starting to unwrap and I was worried about it ripping off. This resulted in me wrapping each one individually which meant that I could put the eggs much closer and use more of them. It looks a lot nicer/fuller this way too and it sat on our table for a couple of days before I gave it. It stayed in tact but when I gave it to them, my mum says the grooms mum was complaining its falling to bits! I guess they were moving it around too much and maybe taking out and putting in the eggs too much that they weren't as sturdy anymore. I saw it yesterday and it looks a sorry state. I have been asked by the grooms mum now to make a fruit creation for Saturday evening. I've never made one before so lets see how that works out. I'll try and take a photo if it doesn't take a long time to make. I LOVE the colours with this one. Purple is so punchy and versatile!